We helped Sealed distilled the complexity of their business model into a simplified brand promise and experience that would win trust with an inherently skeptical audience. Imagine a company that helps consumers make their home more energy efficient and comfortable by combining design, contractor relationships, energy efficiency incentives, long-term purchase agreements and financing. What would you call it and how would you describe it simply? Distilling the complexity of this business model into a brand platform that would win trust with a skeptical audience was our principle challenge. As we worked through this puzzle, our foundational concept become: “an energy company that invests in you”. The statement conveys what is at the heart of Sealed’s offering while also opening up a dialog with consumers. The details of HOW Sealed delivers value may be complex, but the results are simple and emotionally resonant. 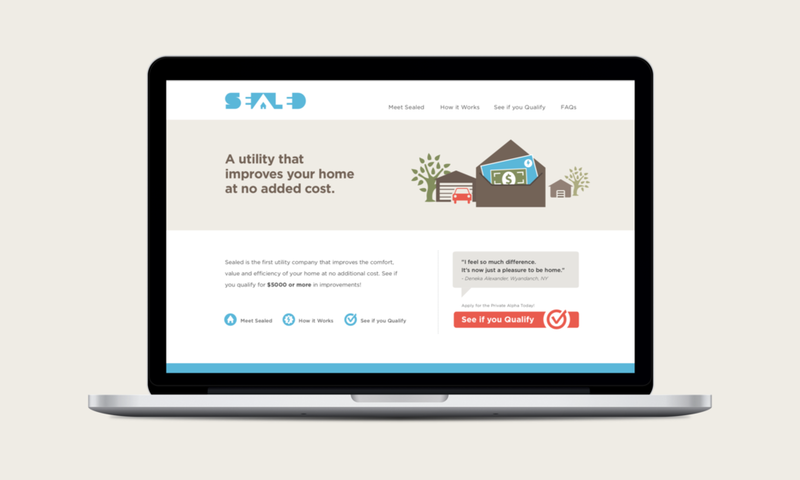 By immediately addressing the shift in how to think about your home energy ecosystem, we helped initiate a series of digital experiences to build trust and drive growth. Making your home energy efficient, makes your home more comfortable (and saves you money). The comprehensive brand platform we developed in collaboration with the founding team was designed to consistently reinforce brand values across touch points. Along side the client, we developed critical components that drove the overall customer experience included a tablet optimized sales tool and billing portal. We utilized human centered design principles, simplified data presentation and clear language that stands in sharp contrast to the experiences provided by traditional utilities. David, Tino and the team, helped bring our paradigm-shifting startup to market by reimagining how an energy company could invests in you. Our work led to increased consumer trust and higher sign-ups rates in several regional test markets. Since the launch of the new brand and selling tools, the company has successfully gained significant traction and additional rounds of venture capital.